We're in! At 2:08 AM, August 16th, we turned on the new transmitter for the first time, initially at a low 5,000 Watts, and within a few minutes, tested the system at 25,000 Watts. The new transmitter worked perfectly! Since then, we've powered the transmitter down to our authorized 10,000Watts -- the higher power is a couple of legal hoops and another month or two away. As the leaves on the tundra's hardy plants turn to brilliant red and gold at the beginning of September, we thank each of you for your prayers and your financial support which have made this dramatic improvement possible. Your life may be the only gospel some people will ever read. 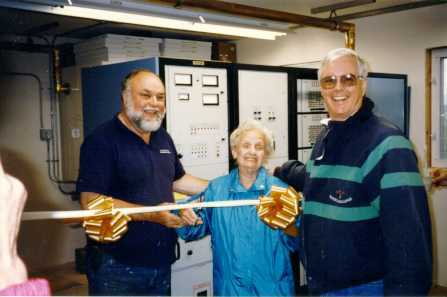 Top of page 25,000-WATT SMILES: (Left) On behalf of all of our generous donors, KNOM contributor Antoinette Lauer cuts a ceremonial ribbon to inaugurate the new 25,000 Watt transmitter, with the help of KNOM's Les Brown (at left) and general manager Tom Busch. Do you see the pipe at the top of the photo, behind Tom's head? INSPIRATIONAL SPOT: Love is in season at all times and within the reach of every hand. Anyone may gather it and no limit is set. Everyone can reach this love through meditation, a spirit of prayer and sacrifice and by an intense interior life. Top of page At press time, this just in...KNOM RADIO WINS THE 1997 GABRIEL! We keep shaking our heads in shock and delight. 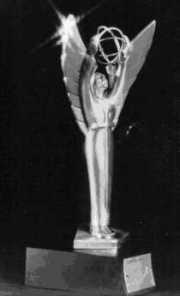 KNOM has been honored with the 1997 Gabriel Award "Radio Station of the Year!" It's our second year in a row, and our fifth such Gabriel since 1979! Tom Busch will accept the award at the Unda-USA banquet November 8th in Arlington, VA. If you'd like to join us that night, write for information on obtaining tickets! WHAT�S NEXT? In late August, Anchorage consultant Mel Sather will fly to Nome and make radiation measurements near the tower, to determine the safe distance for humans. We�ll then build a security fence at the appropriate distance and file papers with the FCC for 25,000 Watt authority. Also in late August, workers were set to drill four pilings about 30 feet away from the new building, to provide footings for our new emergency generator shed. More on that next month! PIPE DREAMS: The pipe you see rising from the transmitter and running across the ceiling (in the ribbon-cutting photo above) is 3-1/8th inch copper transmission line. It carries the transmitter�s 25,000 Watt output to the antenna. The line comes in 20-foot sections and can be difficult to ship. Our first shipment, which was supposed to have gone air freight from Connecticut, wound up on a truck and was lost for over a week. The factory sent a second shipment to JFK airport in New York, bound for Anchorage overnight by 747 jet. Unfortunately, somebody forgot to unload the transmission line in Anchorage and the plane proceeded to Australia. When the mistake was discovered, the line wound up back at JFK. It was obvious that we would not have transmission line in time for a mid-August startup, and due to many other factors, that would delay things until early September. That, in turn, would delay our removing our old shacks, and like a set of stacked dominoes, that would delay construction of our new emergency generator building until summer 1998. To the rescue came our old friend, tower contractor Rod Ewing. Rod recalled that hundreds of feet of used transmission line was lying in storage at Goose Bay, near Anchorage.One of Rod�s workers picked up thirty feet of the surplus line and loaded it onto a freight flight to Nome, where Rod installed it the next day, less than one day before our scheduled startup. Whew! INSPIRATIONAL SPOT: I have decided to stick with love. Hate is too great a burden to bear. 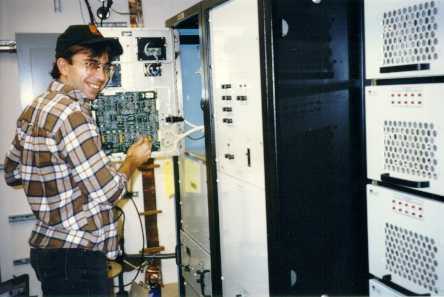 -- Martin Luther King, Jr.
Top of page TUNE-UP: (Left) Jeff Welton is the field technician for Nautel, Ltd., who manufactured KNOM�s new transmitter. Jeff flew in August 15th from Hackett�s Cove, Nova Scotia to commission the unit. He left from here to Norfolk, VA, and from there to an installation in Peru! Top of page JOY! 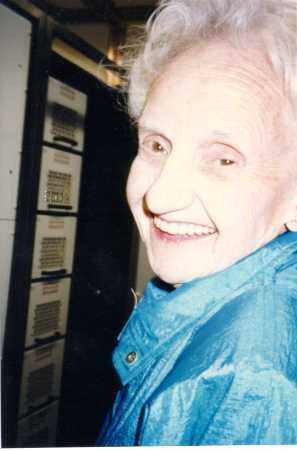 Antoinette Lauer�s smile reflects the joy of everyone associated with the KNOM mission when the new 25,000 Watt transmitter came on line smoothly, without a hitch. Located 3 miles from Nome on the remote Bering Sea, the installation replaces our "highway construction shack" building with a safe, modern installation, and boosts our transmitter power. On behalf of our thousands of remote Eskimo and Indian village listeners, thank you for helping to make this wonderful new transmitter possible! VISITORS: Antoinette, two neices and a nephew were the only ones in Nome for the big event, but we have been delighted to meet several other KNOM benefactors this summer. A sincere thank-you to Paula (Mrs. Les) Brown, who stepped in to run the office while Florence Busch was away, helping a former KNOM volunteer move to the Lower 48. Thanks to Paula, things ran smoothly, during a very busy time. Thanks also to Ross Tozzi, back for a few weeks before his second year in the seminary, and to Linda Raab, who returned to volunteer through October. INSPIRATIONAL SPOT: The essence of married love is not romance, but forgiveness. Romantic love needs to deny and overlook flaws. Mature love is capable of loving flawed people. Full size SOMETHINGISN�T FISHY: It�s the fish...there aren�t any! Fish and Game halted all taking of silver salmon when the run turned out a dismal 10% of normal. What�s happened to the fish? Nobody knows, though experts suspect past over-harvesting, interception by large commercial outfits 800 miles to the south, as well as foreign trawlers on the high seas. ANOTHER MYSTERY surrounds "a large number" of birds washing ashore along Saint Lawrence Island, species including kittiwakes, bald eagles, murres and puffins. The Bering Sea is several degrees above normal temperature this year, and biologists suspect that the birds� food supply might have been affected. According to U.S. Fish and Wildlife, such die-offs "have been observed every decade or two in northern countries" and don�t appear to affect the strength of the overall bird populations. WHOOPS! 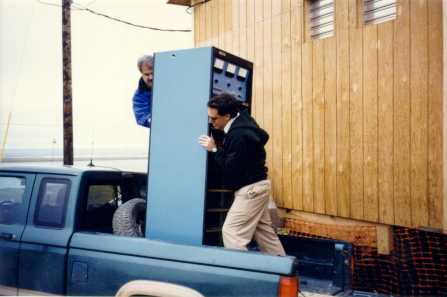 Ric Schmidt, behind the rack, and Ross Tozzi steady the shell of the old 10,000 Watt transmitter, preparing to move the unit to town for packing. We�ve sold it to a station in Renton,WA, with proceeds to help offset costs of the new installation. TO THE BIG CITY of Anchorage flew KNOM news director Tom Bunger, to help coordinate live gavel-to-gavel coverageof a huge summit meeting on subsistence use of fish and game, a gathering of 600 native leaders. Thank you for giving KNOM listeners front-row seats! CAN YOU HEAR KNOM? You bet, if you live in western Alaska. Our signal has never been heard in the Lower 48, however, on account of a couple of powerful stations on our clear channel frequency of AM 780 kHz. To hear our award-winning blend of inspiration, education, music and news, you need to be within 500 to 1,000 miles of Nome. AU REVOIR to Paul Rauch, a wonderful KNOM volunteer since 1995. Paul�s remaining in Nome, so we�ll continue to hear him on the air now and then. THANK YOU for your prayers and your continuing support which keep our mission signal strong. May God bless you! PO Box 988, Nome, Alaska 99762. We'd be happy to mail you a printed version of the Nome Static (which includes more information than the online version). Award-winning KNOM is entirely supported by individual donations by people like you. 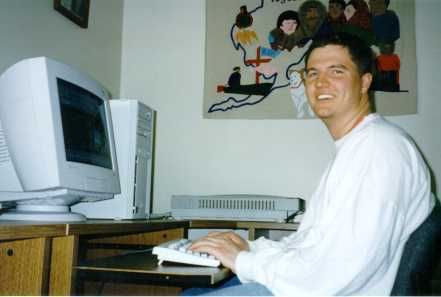 Copyright 1997 KNOM. All rights reserved.